Benjamin was born on the 1st of March 1888. He was two years younger than his brother Levie. He married Roosje Valk (born in Wildervalk on the 20th of August 1896), she was one of nine children of Jacob Mozes Valk and Betje Feschien Levie. Benjamin and Roosje had two daughters: Clara Betty (born on the 4th of October 1925) and Betty Clara (born on the 8th of April 1928). In the first few years of the Second World War both daughters were still at school. On the list of September 1939 that G. Lindeijer (head of the state high school) made for the collection of the school tuition fee, is the name of Clara Betty, student in class IIA. 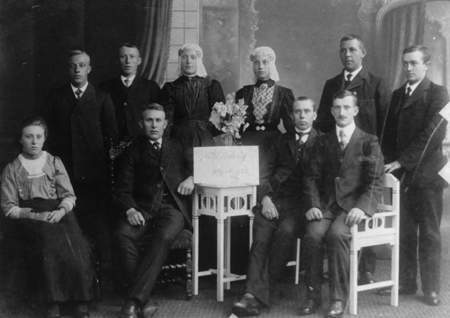 About a year later, being in the fourth class, she was removed from school and together with a number of fellow students they had to attend the Jewish high school in Zwolle. First Benjamin and his family lived next to the business at 48 Woldstraat; later on they rented the house 14 Beatrixplantsoen from Mr. G. ter Braake. On the 17th of May, the Germans already claimed this house; the Levie family consequently had the dubious honour to be the first Jewish family to leave their home. 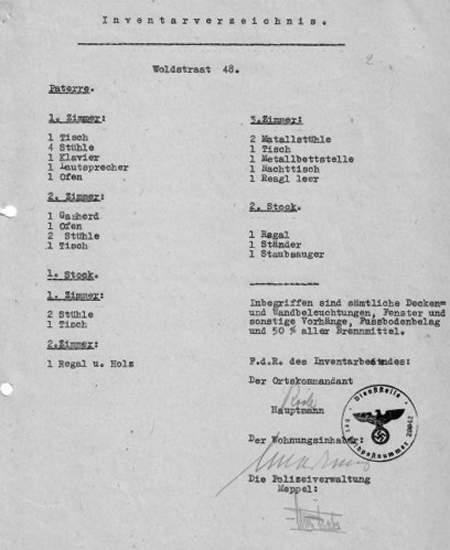 The ‘advantage’ of the move at such an early date was that the Germans compensated the Jews for the costs of the move; the Levies got a compensation of f 281,70. Their house was given to a sergeant of the air force, the man who would later on cause a lot of problems for the Kats family. 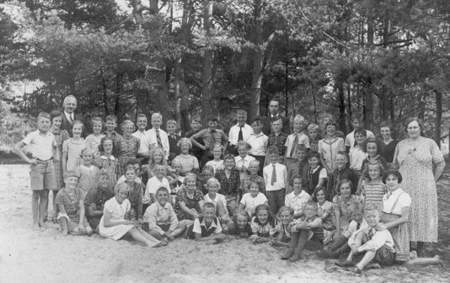 The Zuiderschool on a school trip in 1938; second row, far right Betty Levie. The Levies moved again, this time to the corner house on Woldstraat and Vledderstraat, which they had left some time before. On the 6th of June, they were almost in great trouble; an official poster board had been fixed to their house with mostly pro-German posters on it. When pupils of the Vledderschool took away these posters, the Levie family was suspected of having done that. Mr Levie notified the police of this ‘disgraceful deed’ in order to prove the contrary. Regularly, the Levie brothers would come to Ruinen. 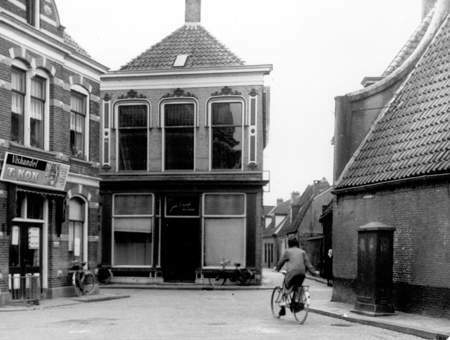 They were born there, but later moved to Meppel, on the corner of Woldstraat, where later on Mr Kraak had a tailor’s. Benjamin came often and Levie only a couple of times. They sold materials for dresses and had a great selection. Levie always mentioned the gloss that lay over the coupons he sold, we called him: ‘glaansjeude’ (‘glossy Jew’). Their sister Eva was married to Cohen. They were a bit less well to do and lived at 20 Voorstraat. I remember that well because at the beginning of the War we sometimes brought them potatoes. Cohen [he traded in caps etc., TR] did not come with his suitcase anymore; they were terribly afraid and they had to wear a star. They had tears in their eyes and shook our hands for a long time before we left. confiscated by the Wehrmacht (the German army). At the end of July, Benjamin Levie was transported to the labour camp in Orvelte. Eva and her daughters Clara Betty and Betty Clara were taken from their home on the 3rd of October. Someone still remembers when the Meppel police took the two girls from the house on Woldstraat; they were screaming and yelling. They all ended up in Westerbork. The whole family was transported to Auschwitz on the 10th of November 1942 and died on the 13th of November. The business of the Levie brothers did not survive the War either. In 1941 the shop came into the hands of a ‘manager’ and when the family had gone, the shop was being liquidated by Omnia. At first the Germans saw good prospects for this company and appointed a manager: F. Hoemels from Winterswijk. The shop of the brothers Benjamin and Levie remained open and was run by the manager by order of the Germans. There was even a shop assistant, Wilhelmus Jozephus A. Lurvink. The store above the shop was used to put up German soldiers. On the 5th of December 1943, H. G. Muysson from Deventer replaced manager Hoemels. Already after two days he had to make way for R.A.Th. Hoedt, who acted as a receiver/liquidator. It seems that Omnia had come to the conclusion that the business had to be liquidated after all. Probably, because none of the managers wanted to take over the store. The Levie brothers’ shop was finally liquidated on the 20th of June 1944.